Allan Hall from AJH Synth has been busy again – cooking up some luxurious analogue loveliness for you all! 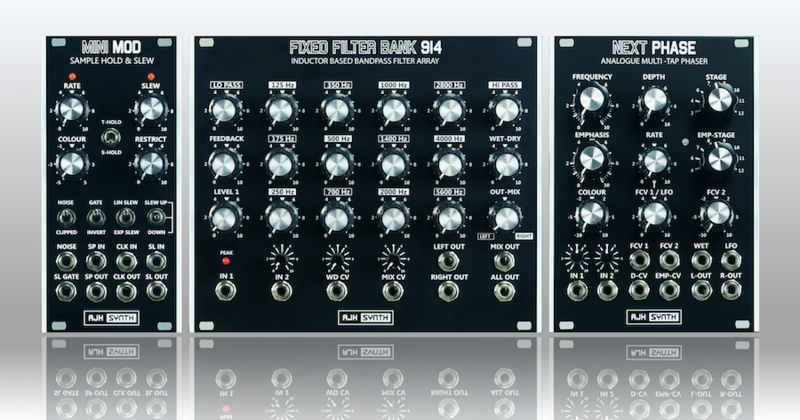 There are no less than THREE brand new modules now in stock, in Dark Editions: the FIXED FILTER BANK 914, NEXT PHASE phaser and SAMPLE HOLD & SLEW. The standard “silver” (Aluminium) versions will be available in 6-8 weeks. Dark Edition – WAVE SWARM, SONIC XV, V SHAPE, GEMINI 2412. Silver (Aluminium) – WAVE SWARM, SONIC XV, MINIMOD VCO, MINIMOD CONTOUR GENERATORS. Allan Hall has this time turned his hand to the venerable FIXED FILTER BANK 914 – originally found in the 1960’s Moog™ 900 series modular synthesiser system. He has made it compact enough to fit into skiff friendly Eurorack cases, and has added some other very useful features too: the bands are split alternatively to left and right channels, each having their own individual output; and there is also an inbuilt Voltage Controlled cross-fader that allows panning between the left and right banks – with a mix of all bands available in the central position. There is also a WET-DRY VC-Crossfader and an integrated FEEDBACK control which can be performed with to produce howling wails of tuned, distorted oscillation if desired! Alongside this we have the NEXT PHASE 12 Stage Multi Tap Phaser – a development of the earlier MegaPhase 12 unit – featuring improved signal-to-noise ratio and other additional features such as independent Level Controls for Input 1 and Input 2, and a Phase “Colour” Control, which can lighten or darken the phasing effect. Please see the relevant product pages – along with DivKid’s excellent videos below – for further details.